Spanish writer Benito Pérez Galdós, author of vast, sprawling novels such as Fortunata and Jacinta, can be accessed somewhat more expediently via his 1893 novella Tristana, recently published in a new translation by Margaret Jull Costa. The work’s relative compactness diminishes nothing; Tristana possesses a snow globe quality, an entire world in miniature, presented and circumscribed as though under glass. The title suggests an unhappy tale, and Tristana indeed contains a panoply of circumscribed, unhappy circumstances and events: oppressed childhoods as dire as any in Dickens, sexual and spiritual exploitation, frustrated love and destroyed hopes, physical degradation and suffering connected to illness, age and enervation. But a deep psychological sensitivity; crisp, ironic tone; subtle but ample humor; complex, memorable characters; and exceptionally rich language help leaven these heavy aspects. In its age-old situation of an older man’s relationship with a young woman, Tristana feels nearly iconic. Pérez Galdós sets the tone early, through a tableau vivant in which he first introduces, recounted at arm’s length by an unnamed narrator, his two central characters. The ensuing narrative delicately traces relations between Tristana and Don Lope, beginning with further background, then, coincident with Tristana’s awakening to the injustice of her situation, slowing to portray her growing self-awareness and desire to make something of herself. A clandestine attachment with a young painter, Horacio Diaz, occupies the bright center of the story, until the trajectory begins a descent marked by adverse irruptions of life - distance, illness, the impositions of an older generation – that imperil youth, love, hope and self-determination. This directness continues as Tristana questions other constraints on women’s lives - in education, sexuality, marriage and motherhood. Inspired by Horacio, who encourages her to “find the formula…to perhaps resolve the prickly problem of the free woman,” Tristana looks to art as a possible path, bemoaning women’s education in the arts as “insubstantial…intended to help girls bring a good son-in-law home.” She asserts her sexual independence in defying Don Lope’s threats in order to be with Horacio, declaring, “I am not an adulteress; the only person I am deceiving is someone who has no right to tyrannize me. My infidelity, therefore, is not infidelity at all.” Marriage she sees as an arrangement between willing individuals, not some unity of souls: “Living as one for the other! Two for one! What nonsense…” During a lengthy discussion with Horacio concerning the possibility of their having children, Tristana fiercely asserts her view of fatherhood as little more than a mechanical function; were she to become a mother, the child would be hers, not theirs. This epistolary section of Tristana also limits our knowledge of the action to what is being reported by the two young lovers, at last allowed to speak for themselves nearly free of the dispassionate narrator. In the spaces between these letters, though, one reads an entire invisible story, outlined by the difficulties of maintaining the relationship through nothing but writing. Pérez Galdós complicates the resolution of the “prickly problem” first by this love affair, in which art loses out as Horacio turns to painting “flowers and dead animals” as a “cargo of sentimentalism” flies back and forth on the mail carriage, and then by injecting a dose of reality so abruptly factual – an illness and surgery, evoking Charles Bovary’s botched clubfoot operation in Madame Bovary - as to irreparably contaminate any “idealized” conception or promise of happiness. It’s an invention that relieves Pérez Galdós of fleshing out how Tristana might have fought for her independence (and according to the introduction came in for criticism), but it also stresses the unpredictable “cruel realities” life can impose in a moment and serves as a potent physical symbol of the cutting off of Tristana’s potential. The glow from the lovers’ letters fades as reality intervenes and as the softening of Don Lope’s hard edges brings him again closer to Tristana in scenes that render him all too wretchedly human. The years go by; age, infirmity and submersion in the facile comforts of religion take their toll. The narrative, again recounted matter-of-factly by the outside observer, regains its snow globe quality. The tossed-off question posed by this narrator at the novel’s end manages to be both affectingly poignant and, in its detachment and irony, sharply pointed, underscoring how lugubriously such a triste tale might have been told. 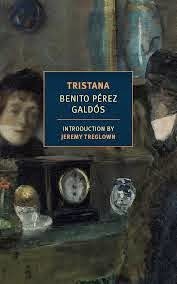 In Tristana's overt rejection of past literary approaches, and its vivid, assured portrait of artistic aspiration and the multifold impediments to its realization, perhaps the telling of the story, the creation of art, is as much the subject of Pérez Galdós’ novel as is Tristana herself. As an artistic creation, balancing piercing social criticism with a tremendous sympathy and tenderness, this short, beautiful novel is anything but unrealized. Tristana is published by New York Review Books. Dwight at A Common Reader has written on Tristana as well as other works by Pérez Galdós; I'm indebted to him for first making me aware of this writer, and hope to follow him in exploring Pérez Galdós' longer novels. Tristana is very much on my radar - Guy wrote about it earlier this month and your review confirms its merits. I love the way you've likened this novel to a snow globe depicting an entire world in miniature; that's a great description. It sounds as if the author has managed to pack quite a lot into this slim novel. Margaret Jull Costa is another selling point for me as I'm a fan of her work on the Javier Marias translations. Jacqui - I'll have to get over to Guy's site to have a look. I'm very enthusiastic about this short novel, and so I'm glad to hear it's on your radar. I'm glad too to hear that Margaret Jull Costa is a selling pointl; I can't imagine one could take a section like the letters between Tristana and Horacio and render such linguistic pyrotechnics into such delicious English, but there it is - such great pleasure to read language like that! Hey, Scott, welcome back to blogging! And with such an appetizing review. Thanks very much Miguel! I'm happy to be back. I'd wager that this is a book right up your alley. Just found out that Eça de Queiroz admired him and considered him one of the greatest Spanish language writers, alongside Cervantes and Quevedo. I have not read Benito Pérez Galdós but I want to. As you allude, the fact that the author skips any idealization of the relationship between the older protagonist and Tristana sounds refreshing. Many thanks, Brian! This little gem seems like a great entry into Pérez Galdós, especially if one isn't quite ready to take on one of the fat works. I second Miguel's welcome back, Scott, esp. since this somewhat less heralded Galdós sounds so dang appealing: love the idea of the epistolary interlude as a narrative change of pace and, of course, that lentils joke is a classic regardless of its relation to more important matters in the novel. I wonder what Galdós and Eça de Queiroz thought of each other. Thanks, Richard! I think you'll love this one. I'd be curious too to know what P-G and de Queiroz thought of one another's work. My guess is that they'd have admired one another. I'd also like to know more about P-G & Leopoldo Alas' thoughts about one another. The situation of the young lovers in this novel - their struggles to rise out of the muck of the society around them - reminded me quite a lot of La Regenta. Galdós probably didn't think anything about Eça: in his library there weren't many Portuguese books, and a few of the existing ones still had the pages joined together, and it seems he had no great interest in the neighbouring country. There's no evidence, as far as I know, that he ever read Eça. Eça, on the other hand, read him and considered him a great novelist, alongside Cervantes and Quevedo. Emilia Pardo Bazán, on the other hand, admired Eça immensely. Miguel - I assumed Richard's question may have been partly hypothetical, but I'm pleased to know of Eça's admiration for his Spanish contemporary - and of Bazán's admiration for Eça. Jeremy Treglown, in his introduction to the new Tristana translation, mentions Bazán's review of the book - something I'd like to find if it's been translated - as Treglown implies she may have had a more critical view of the novel's feminist elements. Thirding that: it's good to have posts here again. Thanks so much, Umbagollah. I hope to post a bit more more frequently from here on out. Encouragement like this is certainly a motivator. Excellent review. I read a few Galdos' novels years ago (Dona Perfecta, Nazarin...) and was really pleased to see this translated - and even more pleased to see how warmly it's been received. Many thanks! Aside from a regretfully abandoned attempt at Fortunata and Jacinta a year ago, this was my first Pérez Galdós. The warm reception is well deserved. I'm now curious to see the Luis Buñuel film adaptation. To echo Tristana: I want to know more and more and more. Of this compact novel so full of "feminist" ideas and finely drawn characters. I like the many transformations (of characters, of prose style) you describe in this book, Scott. Rise - you will not be disappointed. A great book of transformations - and of stasis too. I'll have to read this someday. La Regenta first, though. Tristana pairs nicely with La Regenta; in the interest of brevity I tossed from a draft of this post a long paragraph relating the two in their depictions of characters sometimes heroically getting their heads above the social mire. Pérez Galdós may be more subtle - it's easy to see why Eça de Queiroz would have admired him - but Alas' ability to get really riled up has its own seductions.